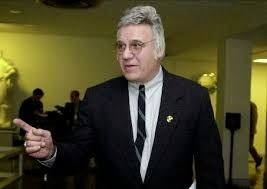 Ex-U.S. Rep. James A. Traficant Jr. was a very colorful character who was known for ending his congressional speeches by exclaiming "beam me up." He was expelled from Congress for taking bribes and other crimes. Mr. Traficant is in a medically induced coma after having a tractor flip over on him. GREENFORD — Ex-U.S. Rep. James A. Traficant Jr. is in “very critical condition” after an accident on his family farm, his wife, Tish Traficant, said today. The former congressman, 73, is “sedated and he’s not doing well,” his wife told The Vindicator a few minutes before heading back to the St. Elizabeth Health Center in Youngstown, where he was taken after first being rushed to Salem Regional Hospital. Traficant was driving a 1943 Ford tractor about 7:50 p.m. Tuesday at his family farm on West South Range Road about 140 feet into a large pole barn when the vehicle struck a large steel blade on the ground, said Goshen Police Chief Steve T. McDaniel. Doctors will determine if there is any brain activity about 72 hours after he was brought to St. Elizabeth, Kovachik said. Honestly, the headline in this case is inappropriate. There is no humor in a tragedy such as this.